Recently, after a software upgrade, the "Open Link" item in my xfce4-terminal right click menu stopped working: instead of opening the clicked URL in a new Firefox tab, it now opens a whole new Firefox window showing just the Firefox starting page. How can I fix this so that I can open links from the terminal again? This is caused by the removal of the -remote command-line switch in Firefox 36. If you have Mozilla Firefox selected as your preferred browser in the Preferred Applications settings, the terminal (or, rather, exo-open) is still trying to use that obsolete switch, which confuses Firefox. See this bug report (bug #1429284) for more details. 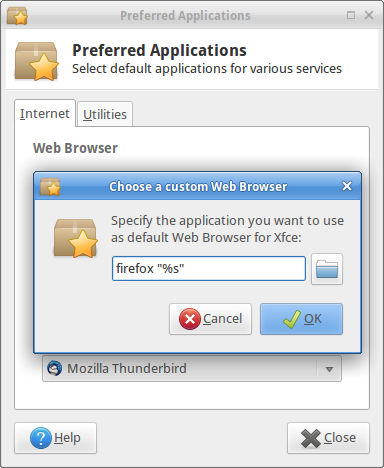 Open the Preferred Applications setting (found under Settings in the Xfce menu, or by running exo-preferred-applications from the command line). Click the Web Browser selection menu, and select "Other..."
You should now have "firefox" (as opposed to "Mozilla Firefox") selected as your preferred browser. Now just close the Preferred Applications settings, and try opening a link from your terminal — it should work normally again. Not the answer you're looking for? Browse other questions tagged xubuntu firefox xfce4-terminal or ask your own question. open link from chrome to firefox? How can I get Firefox that I installed manually to open external links?